If I had to name my favorite knitting blog, I would without any hesitation pick needled, the blog by the many talented Kate Davies. Kate stands above the crowd for any number of reasons. First, her designs are absolutely beautiful; immaculately designed and crafted. Second, Kate is articulate; it is an extremely well-written blog. Third, Kate is an (ex-)academic, who brings her skills, focus and enthusiasm to bear on knitting; she is a fabulous scholar of knitting history and textiles in general, and related issues, such as textile employment, gender, and industrialization. (She also, incidentally, has wonderful posts on all sorts of other intellectually stimulating topics. She once wrote a beautiful post on the many different available translations of a German poem. My children, who grew up in Germany, spent hours discussing this post and the various translations she cited.) And fourth, Kate suffered a massive stroke two years ago, and has chronicled her stroke and on-going recovery in the most astonishingly honest and articulate fashion. I work in a research neuroscience environment, where we frequently deal with people attempting to navigate through the mine field of post-stroke recovery; and I know that such an articulate first-person account is rare indeed. Kate shot to fame in the knitting world with her fabulous Owls sweater, which has been knit by thousands of knitters around the world. It comes in both adult and child versions. I knit it myself, for my daughter Leah, a number of years ago. Here is a photo of Leah wearing it, taken in March 2009. Kate is no longer able to work as an academic, as a result of her stroke, but has managed to make a name for herself, as well as an income, by selling her beautiful designs. The Owls sweater, as her first and most famous piece, has helped to make this possible. Yesterday, Kate wrote a post, which you can find here, detailing how the design has been copied and is now being marketed by Debenhams, a retail department store in the UK. The Debenhams version is a cheap, poorly made second cousin to Kate’s but is clearly a knockoff. This brings up a lot of interesting questions about intellectual property and the design process. I am not a lawyer and don’t know much about copyright law, but I tend to agree with Kate, that this is theft of her design. 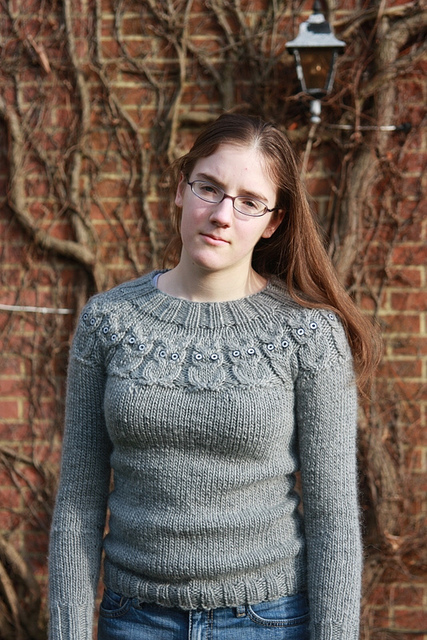 I think it would be difficult to be a knitter with an online presence and not be able to instantly identify the Owls sweater as a Kate Davies design. Kate argues very convincingly in her post that the design has become iconic. There are well over 5000 of them documented on Ravelry, each of them hand knit using Kate’s pattern. Even the BBC acknowledges her pattern, which will be worn later this year by a character on a TV crime drama (can’t wait to see that)! Some may feel that fashion always borrows elements from other designs, and this is just how the industry works. On Ravelry, for example, I have seen many examples of someone reverse engineering a design that they have seen somewhere (say, an Emilio Pucci design, or alternatively, something they have seen at the Gap or Anthropology). Copying a design to knit something for yourself, is one thing, however; copying it and selling thousands of them on the High Street quite another. When Kate first made the pattern for Owls, she didn’t sell it, but made it available as a free download. Much later, when the design first began to be copied for financial gain (detailed in her post), she was advised by lawyers to start charging for the pattern. It can now be purchased from Ravelry (and presumably directly from Kate) for £3.95. I was one of thousands of people who downloaded the pattern for free and knit it. Today, I bought a copy of the Owls pattern. (I already own many of her other lovely patterns, such as the fabulous Peerie Flooers hat I have blogged about here.) I encourage knitters to show support for Kate in the best way possible, by purchasing a pattern from her; you can make a statement and knit a beautiful garment in one blow. I also encourage each of you to read Kate’s post; it is of interest to anyone interested in design, in copyright issues and intellectual property law, and also in the story of knitting in the age of the internet. I have no idea what the legalities of the issue are, and imagine they are rather complicated, but one thing that we can all agree on; the handknit versions of Kate’s sweater, using her lovely design, are infinitely more beautiful than the knockoff. This entry was posted in Main and tagged copyright, Debenhams, design, intellectual property, Kate Davies, Knitting, Owls by knitigatingcircumstances. Bookmark the permalink. Amazing, huh? Not only did they copy her design, but they managed to make it ugly in the process.